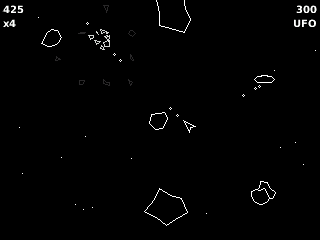 This is a screen of the Atari game Asteroids. This past weekend I went with my daughter to OMSI, which had an exhibit on video games. The exhibit was chronological, so as one walked in the space was populated by the arcade video games of my youth, such as Pacman, Centipede, Donkey Kong, and Asteroids. The Daughter is a dedicated gamer, so I was curious how she would do at Asteroids. Both her and I really sucked at the game -- me, because I'm old and wizened; she, because she found the buttons unintuitive, lacking the fluency of an Xbox controller or joy stick. Also, the simple conceit of trying not to get smacked by a rock the Daughter found not all that interesting. The exhibit went on to showcase breakthrough games and designers, with screens of various sizes and other means of display. I found the nature of the games OMSI showcased as well as the people behind them interesting as to the new forms of technology employed as well as the artistic direction. My main complaint was that there was just one screen after another with epic games that would take hours to gain a rudimentary fluency. One had to read the blurb and take the info on faith, or hope a passerby could play the game with enough skill to showcase some of the remarked-upon elements. The sun was shining so we couldn't concentrate all that long on the exhibit. Sometimes nature does win over Minecraft. so there will be less memory accessible to the amusement itself. check Continuously hope to get no less than one fair designs card to run with your unit. A silly card game probably invented to keep kids out of trouble,unblocked games Spoons is a bluffing game (with some elements of matching) that uses simple kitchen utensils as an added play element.